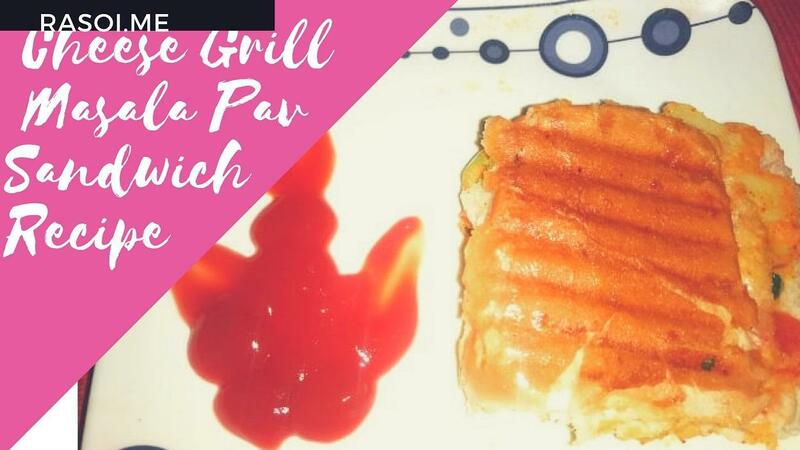 Cheese Grill Masala Pav Sandwich Recipe is a very easy and tasty recipe Rasoi.me. It’s Grilled in Pan or Griller whatever is available in your kitchen. I like this too much because of Lots of cheese containing. Watch this instant snack recipe Rasoi.me and subscribe my youtube channel today for easy homecooked recipes . Start this recipe we take 2 boiled potatoes add coriander leafs green chilles, Chopped onion and tomatoes then we add 2- 3 spoon lemon juice and add cheeses 1 bowl 2 tsp red chilies, 1 tsp turmeric powder and mix it with hand and add half tsp salt. Stuffing is ready make it small balls. Cut the pav from center as shown in video. add this masala balls in it. press it with hand. We use Grill pan Because its Grill masala pav sandwich. Put this stuffed pav into Grill pan. And one side its done change the side. When this Cheese Grill Masala Pav Sandwich is done both sides serve it with tomato Sauce and Green chutney. This is very easy recipe all ingredients are available at your home. Sure you guys will try this recipe and Subscribe my channel for more easy recipes. No Replies to "Cheese Grill Masala Pav Sandwich Recipe"